We manufacture Mount Phosphorus as an Organic-Fertilizer and growth promoter. As phosphorus is Vital to the Growth and Health of Plants. lt assists in converting Sunâ��s Energy and other Chemicals, such as Nitrogen into usable food for Plants. A phosphorus deficiency will lead to stunted sickly looking Plants that produces low quality Fruits and Flower. 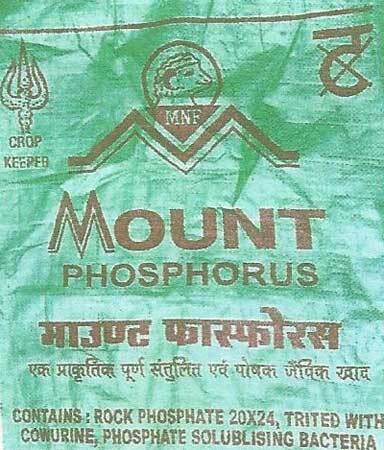 Mount Phosphorus containts Rock Phosphate that is treated with Cow Urine and Phosphate solubilizing bacteria. lt releases phosphorus (P) in soil slowly and being 100% natural. lt doesnâ��t reduce the fertility of Soil over longer period of time.